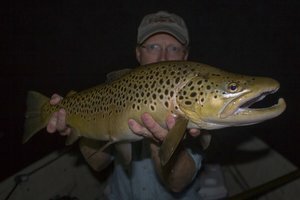 The Trout Zone: Fishing in the Cold or Wind? "cursed by El Nino and its accompanying winds, which until this week had delayed the good summer fishing by two months in the popular Rotorua and Taupo fisheries." I am trying to find it in my heart to feel sorry for those that are basking in the warmth of summer. However, the continual blasts of arctic air make this extremely difficult for me. This of course brings us to the question of whether it is better to fish in the cold or in the wind? How bad is the wind you ask? Well, if someone will send me a plane ticket to New Zealand I will be glad to find out. I have to say, I have fished in some nasty wind before but have never been stopped from fishing. This doesn't mean that the fish were biting but I was going through the motions. 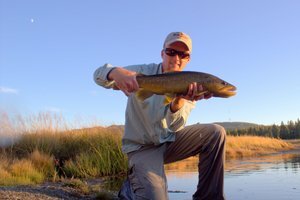 I recall a time when was fishing a lake in the White Mountains of Arizona where the technique of the day was basically to execute a roll cast good enough to get the line off of the water. The wind would do the rest. If you could manage to actually make a full cast, the line MIGHT end up 10 feet behind you on the backcast and this translated to a good 60 foot cast, all assuming of course that you didn't invent a new windknot. 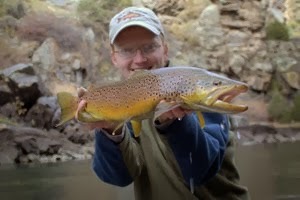 Oh yeah, I caught a nice fat 17 inch Cutthroat that day. 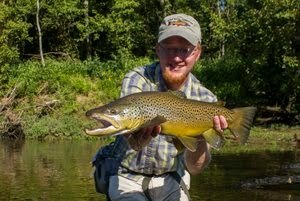 Of course, I've enjoyed some excellent days fishing in the cold as well. Last year I got to fish in the snow for the first time. Being from Tennessee, this was actually a novelty. I guess I can feel a bit of sympathy for the folks in New Zealand. Two months is a LONG time to go without wetting a line. At least I can fish when its cold...and it must be REALLY windy to prevent fishing... Seriously, anyone want to send me a plane ticket to New Zealand? Patagonia? Somewhere warm??? Last year in Yellowstone we were fishing the Blacktail Deer Pond. The wind was blowing so hard that the roll cast was the only option, just like you mention. My 4-weight wouldn't even get a back cast behind me at all, not that I'm the best caster. I wish I had taken my 6-weight that day. Here's hoping that you get rich soon...this cold weather is killing me! By the way, how was Blacktail Deer Pond? Well, it didn't pan out for us. We stopped by as an afterthought on our way to the Lamar after some sight-seeing. The sun was straight overhead with not a cloud in the sky, it was windy and hot. 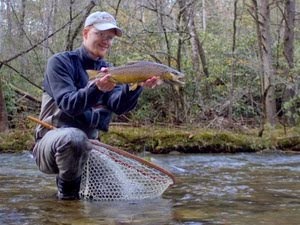 We saw one large fish rising sporadically far out beyond our casting range (I might have been able to make the cast with a heavier rod, but most others in the group were complete beginners). I think earlier in the season would be much better. This was late July. It's a very pretty little pond. Here's hoping I get rich soon, too!